I am a knife snob. 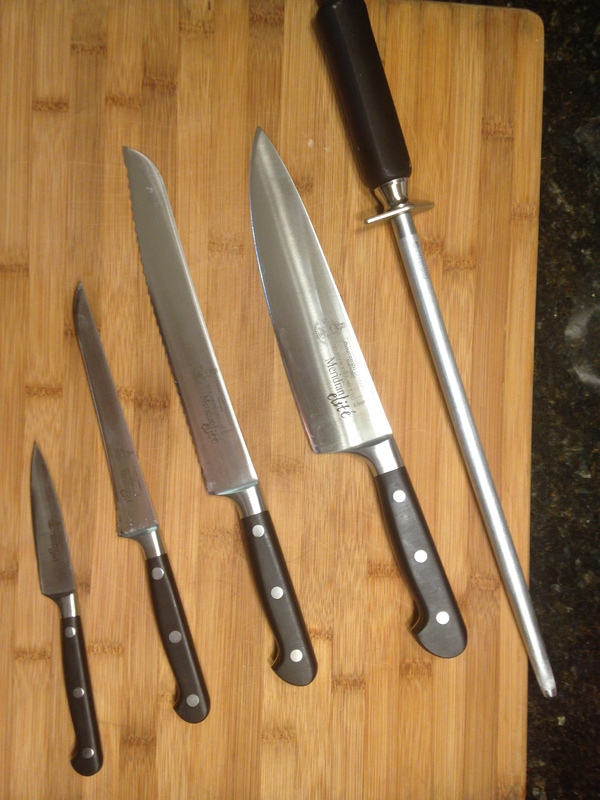 In fact, the standing rule in my kitchen is that no one touches my good knives. 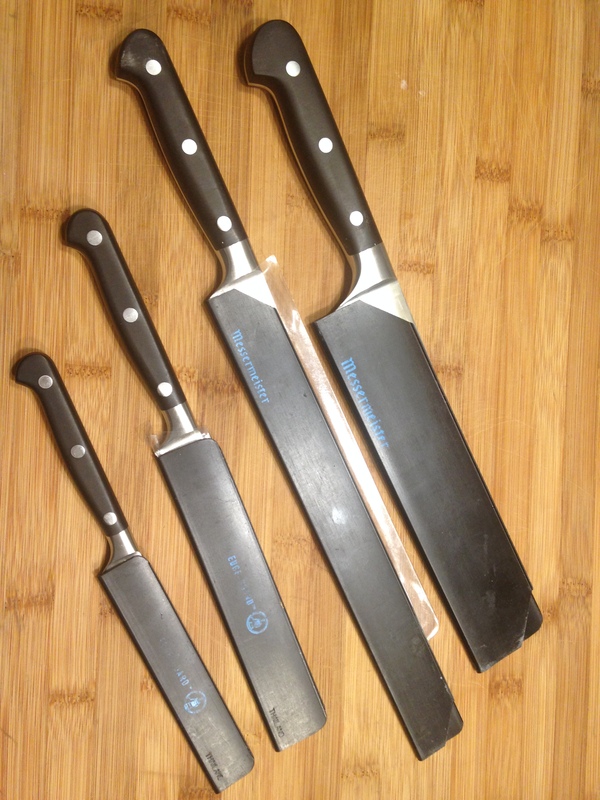 If you want to help cook, you are stuck with the old crappy knives I got as gifts over the years! I also have one pan no one is permitted to use, but we’ll save that for another day! A few years ago I took a knife skills class while in New York City for a few days. Some people visit the Statue of Liberty…I take a knife skills class! But it was life-changing. I came home and ordered my first “real” knives, practiced my cutting skills, butchered countless whole chickens into pieces, and started making my own stock. I’ve never turned back! Here are a few nuggets from what I learned that day. Did you know you only really need four knives? It’s true. You can do everything you need to do in the kitchen with a chef’s knife, serrated bread knife, paring knife, and boning knife. 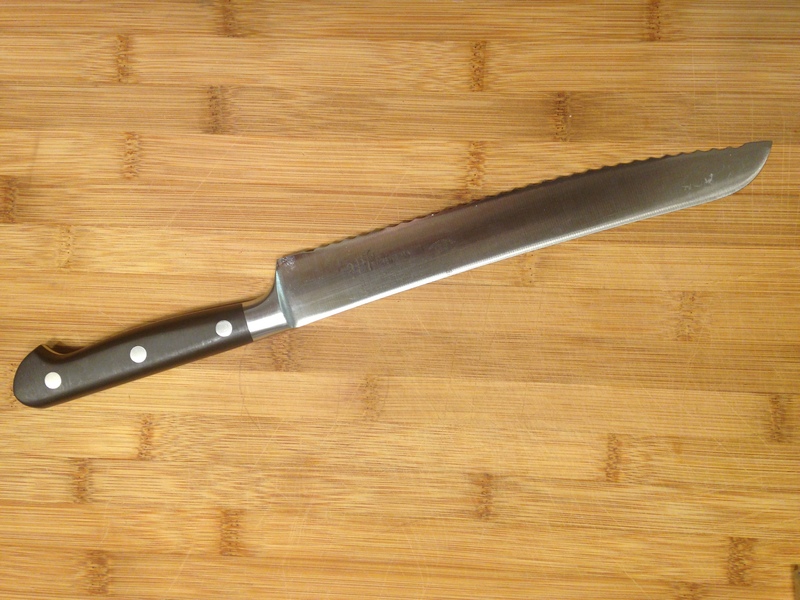 When choosing a serrated knife, the chef who taught my class suggested you look for one with a belly. As you can see on mine, it has a slight curve along the bottom. I use this knife for more than just bread. It works beautifully on melons, tomatoes, and other fruits and vegetables. What’s the best knife or brand out there? It depends on the person. You need to pick up and try a variety of knives to see what feels best in your hand. My babies are Messermeister, carbon forged, carbon steel alloy. I take very good care of my knives. They are washed by hand, never cut anything but food, are used on a wooden cutting board, and stored in protective knife guards. I also run them along a honing steel after every use and take them to a local butcher shop for professional sharpening once a year. I suspect I’ll have these knives for as long as I am cooking! One of the most astounding things I learned during knife skills class was that I had been cutting incorrectly my whole life! One does not “chop” with a knife. You slice through the food in a circular motion. It’s hard to explain. It took me a long time to get used to the appropriate method. Now I know why professional chefs are so quick. The slicing method is much more efficient! So what is your favorite knife or brand? Are you as protective of them as me? Feel free to leave a comment below!